Anonymous anti-Hagel sources: An ever-changing tune. 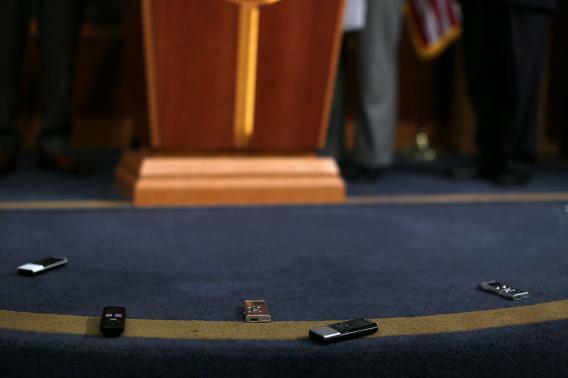 Reporters’ audio recorders sit on the floor at a news conference July 12, 2012 on Capitol Hill in Washington, DC. Carl Levin is pushing past the GOP’s request for a proctology-level examination of Chuck Hagel’s foundation ties. The anti-Hagelians don’t miss a step. Today’s meme, as CTRL+F’d by Jennifer Rubin, is that Hagel is probably hiding something—“a host of shadowy figures whose identities Hagel is so insistent on concealing.” Yes, Hagel released information in line with the committee’s standards and requests, but when Henry Kissinger was up for the 9/11 Commission, Democrats wanted similar information from him—the sin of hypocrisy, if hypocrisy can be applied to how one feels about an apple after stating one’s opinion about an orange. Innuendo aside, I’m struck by the return of the anti-Hagelians’ greatest, yet most disappointing ally: The anonymous Senate staffer. A “disgusted” staffer tells Rubin that the nomination could be sunk, if only this information were released. What else have we heard from staffers? December 13, 2012: Republicans will prove Hagel’s racism! December 19, 2012: Hagel nomination might not happen! Former Republican Nebraska Sen. Chuck Hagel may no longer be President Obama’s favored pick to run the Defense Department, sources told the Free Beacon… Michele Flournoy, a former undersecretary of defense for policy, is currently viewed as the frontrunner for the post. “She will be the likely candidate as there has been criticism from liberals for possibly replacing a female secretary of state with a male, and [Flournoy would be] the first woman secretary of defense,” said one senior Senate aide with knowledge of the process. December 24, 2012: Sunday shows doom Hagel nomination! “I think [Sunday] was Chuck Hagel’s obituary on the morning shows,” said [a] senior GOP senate aide and frequent Hagel critic in reference to Democrats, including Sen. Chuck Schumer refusing to say if they would support him. “The White House got final answer that a Hagel nomination would be dead on arrival so now they move on to [Deputy Secretary of Defense Ashton] Carter or [former Under Secretary of Defense for Policy Michèle] Flournoy. January 31, 2013: The hearings might push Republicans closer to blocking Hagel! “There’s a possibility Republicans could block his nomination, especially after today’s performance,” a Senate Republican aide confirmed to BuzzFeed. So we’ve gone from, “We’ll prove he’s an anti-Semite,” to, “We proved it, he’s done,” to, “We might block him because of the hearing,” to, today, “Maybe we can prove he’s tied to foreigners?” Feel the momentum.